It’s November 19, 2011. The top song is still Rihanna featuring Calvin Harris with “We Found Love.” Last week I forgot to replace the generic placeholders for the artist and title, which is actually hilariously appropriate for this song. The top movie for the weekend is Twilight: Breaking Dawn Part One, the latest installment of a series that dares to tell women that if they’re bland and personality-less enough, they can win an eternity of romance with an abusive monster. So basically it’s the anti-pony. Speaking of ponies and deft segues, on TV we have “May the Best Pet Win,” written by Charlotte Fullerton and directed by James Wootton. It’s a fun little episode, with a catchy song and a consistently amusing competition between the animals trying to earn the spot as Rainbow Dash’s pet. It’s pretty obvious from the start that the tortoise will win via some variant of “slow and steady wins the race,” but there’s so much else going on around that predictable story that the episode ends up oversignified, if anything. For example, from the moment Rainbow Dash confesses that she might be interested in having a pet someday, Fluttershy is immediately all over her. Anyone who spends time around geeks knows someone like that, and most of us have probably been that person at some point: the evangelical geek, the one who cannot wait until you try their newest obsession and won’t stop bugging you until you do. Rainbow Dash is surprisingly willing to humor her, although she does start to get aggravated as Fluttershy offers the pets she would like, rather than ones Rainbow Dash would appreciate. By the end of the musical number, however, Rainbow Dash is fully sold on the idea. It’s rather like the way I, and I suspect more than a few other bronies, got into the show: my then-fiancee was watching it, and kept bothering me to join her. Eventually I broke down and watched the first two episodes, and liked them just enough to keep going a little longer. Eventually, somewhere near the middle of the first season, I realized I was hooked, and became an enthusiastic participant. I suppose this blog is my heli-tortoise, only not as awesome. Nothing is as awesome as a heli-tortoise. Fluttershy, in other words, can be read as a pushy Friendship Is Magic fan trying to persuade her friend to watch the show. As long as she presents the things she likes about it, Rainbow Dash is uninterested; it’s only when Fluttershy starts taking into account Rainbow Dash’s preferences that she starts to build some enthusiasm. And then this interesting parallel just stops, as after the song Fluttershy steps aside and lets Rainbow Dash take over the rest of the episode. Instead, we get something else entirely going on, one of the most subtle “disabled people are just as deserving of friendship and respect” morals I’ve ever seen. Generally, there are two hazards an episode like this has to navigate. It has to make clear that the disabled character really is disabled–if it depicts them being able to do everything an able-bodied person can without any additional effort or assistance it just encourages the (disturbingly widespread) belief that disabled people are faking or exaggerating their condition for attention or out of laziness. (No, seriously; my mother is disabled, and I have witnessed people treating her this way more times than I can count.) At the same time, it cannot treat the disabled person as less than fully a person, with as much to offer as anyone else. Given its usually excellent handling of gender and consistently awful handling of race, it’s completely up for grabs how well Friendship Is Magic will do with a thorny issue of identity politics. Happily, it knocks this one out of the park. Tank’s lack of speed and agility cause him to lose most of the competitions, but he plays to his physical strengths (powerful neck muscles and tough shell) to employ a strategy against Opal that would have worked if Rainbow Dash hadn’t unfairly cut him off. Disabled people aren’t stupid or automatically incompetent at all physical tasks, but again you’d be surprised how many people I’ve encountered who act as if they believe exactly that. In the end, of course, Tank wins mostly because he cares about helping Rainbow Dash more than winning the contest. But he also wins in part because of his difference. 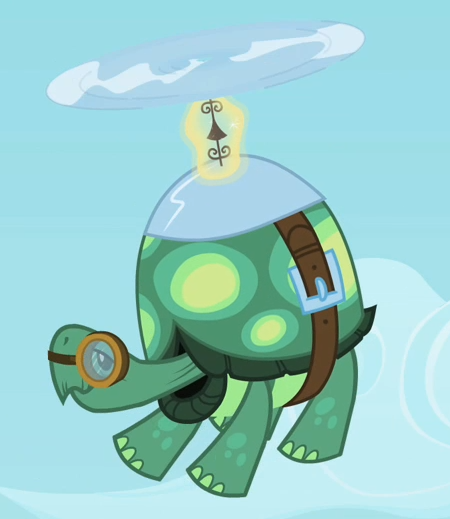 Rainbow Dash and the flying animals all have in common that they can fly, and hence that they are lightly built. None of them can carry the huge boulder that fell on Rainbow Dash–but sturdy Tank can. His strength doesn’t come from his disability (if you are in need of a new one and would like my mother to tear it for you, try suggesting that her disability is in any way a “blessing in disguise”), but is independent of it. His disability is part of who he is, but not the totality. And thus we kick off Rainbow Dash’s character arc. Part of the new freedom the show has found in breaking away from the Twilight-learns-a-friendship-lesson formula is that other characters can now start developing. One of Rainbow Dash’s biggest flaws (appropriately for the Element of Loyalty, in the same sense that Rarity’s possessiveness is the perfect flaw for the Element of Generosity) is her self-centered approach to the world. She tends to discount and dismiss the interiority and subjectivity of others, hence her disdainful and unsympathetic treatment of Fluttershy in “Dragonshy.” Thus, while she has a healthy self-confidence and values her own abilities highly, she has yet to fully understand that there are other ways to be that could be just as valuable. Like Fluttershy in the first part of the episode, in other words, Rainbow Dash has failed to take into account what’s going on inside the people around her, and thus unintentionally behaved obnoxiously. Just as Fluttershy needed to dial back on her fervor and find pets that appealed to Rainbow Dash’s taste, so does Rainbow Dash need to understand that Tank has value even though his virtues aren’t the same as hers. It’s a small step on the long road toward understanding and accepting responsibility for the effect she has on others, and it’s a development that will be revisited more than once in this and the following season. Admittedly, throughout this episode Rainbow Dash is the subject and Tank the object; he is a means by which she learns a lesson about how to treat other people, not a character in his own right. Of course, he’s an animal and a pet, so that’s not so bad, but still, it is a little problematic that our first disabled character exists solely to further the character development of an able-bodied pony. But he gets a sweet helicopter pack out of it, so that’s okay. … You mean that wasn't the joke? A copy-paste error immediately after acknowledging a copy-paste error last week–you should have pretended it was on purpose. Damn, you're right. I lose 15 metapoints.